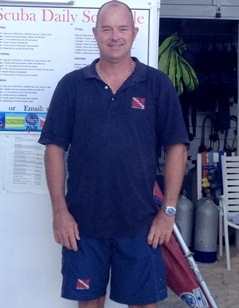 If you are thinking about Anguilla island diving you may want to consider scuba diving with Matthew Billington of Shoal Bay Scuba Karma Charters Ltd.
We had the opportunity to chat with Matthew to find out more about his love for Anguilla scuba diving. He even tells us what keeps divers returning to the island of Anguilla for great diving with Shoal Bay Scuba. Matthew, you are originally an Englishman and you have been in Anguilla since the 1990’s why did you move to Anguilla island and eventually open a dive shop? It all started as a vacation when my father retired to Anguilla island in January 1991. When I arrived, I fell in love with the island and never left. I was lucky enough to be offered a position of carrying tanks for free diving by the only dive shop in Anguilla at the time. While with them, they again encouraged me to obtain my PADI divemaster followed by my PADI Open Water Scuba Instructor in Dec 1991. I continued to work in the local scuba diving industry for a couple years and finally started up on my own in 2004 right on Shoal Bay East, Anguilla. I have been very fortunate to have had these opportunities offered to me and what could be better than getting paid to do what I love. I was researching scuba diving in Anguilla on ScubaBoard, very few divers have ventured to Anguilla island to scuba dive, why do you think that is the case? I think the reason is fairly simple. Anguilla island has traditionally been known for its world class beaches, hotels and restaurants; a hot spot for the rich and famous. Relative to that, the unique diving available in Anguilla has not been well publicized. But we are slowly getting out there, particularly when divers find out about our exceptional and accessible wreck diving. 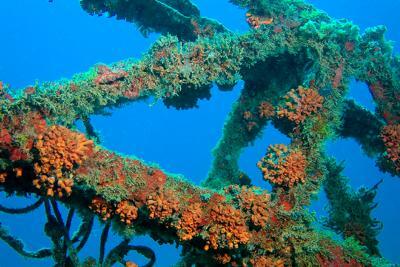 Anguilla has 6 wrecks which are in very good condition. Some highlights of Anguilla diving are our warm waters, as well 45 reef dives and 5 wall dives that are suitable for beginner up to a well traveled and seasoned diver. Anguilla is able to offer dive sites that can cater to all. That is one of the reasons why a lot of our divers come back year after year. First time divers really appreciate their first diving experience with you and Shoal Bay Scuba, what teaching skills are you always equipped with to ensure new divers swim away with wonderful memories? I have been lucky to work for some great dive shops and some great people who took the time to make sure I truly understood that our job is to make sure that every dive is a fun and safe experience. At our shop, we try and offer a kind of 'concierge diving' trying to anticipate divers' requirements, needs and wants. And it helps that even after 20 plus years in the industry I still love diving and teaching more than ever. What makes Anguilla island scuba diving really special to you? Mostly, it is the opportunity to do great diving all morning and then follow with a relaxing afternoon on a world class beach. Really, its the best kind of office anyone could have. What are your favorite dive spots in Anguilla island? I love the wrecks. The mystique and history of them, the fact that you can dive them a hundred times and always find something new of them. They are exceptional! What are some of the marine life that you enjoy pointing out to divers around Anguilla island? My favorite is the small stuff that divers miss like the shrimp cleaner stations or the interaction between the different marine life like hunting trumpet fish or turtles that sometimes follow the divers. When you show a diver how to slow down and really look around them, it's like watching a whole new and subtle world is opened to them and all the sudden they are showing you new things. Anguilla island has a quiet diving community, what do you think keep visitors returning to Shoal Bay Scuba? I am very fortunate to have a wonderful team working with me. They go out of their way to ensure everyone is having a good and safe time, checking in regularly with divers, sharing stories and local anecdotes about the island. My guys all love their jobs and are able to share their enthusiasm with new and experienced divers, making them feel safe and well cared for. I think that's what people come back for. Well that, and the fact that we really do offer some unique and incredible dive sites probably helps too. What do you have to say to those hesitant about Anguilla dive vacations? I would say to them that every place in Anguilla has a unique characteristic to it, and that they should come out and see us, so that we can show them the diving gem that Anguilla is. As well, I would say check out our facebook page at facebook.com/shoalbayscuba, it will give them a glimpse of the diving experience of Anguilla. 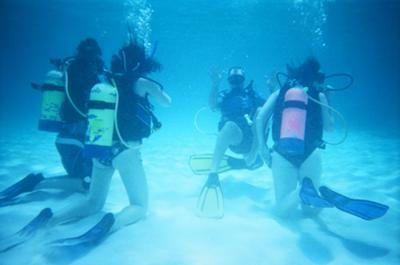 Have A Great Dive Story with Shoal Bay Scuba? If you had a wonderful dive experience with Matthew Billington and Shoal Bay Scuba here is your chance to share it!